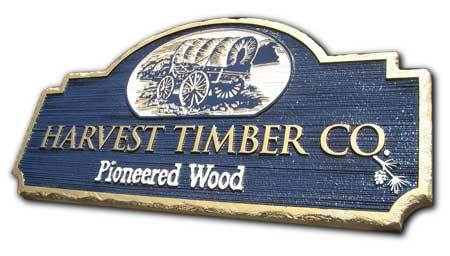 Sign Design and Fabrication - Quality hand crafted sandblasted signs in wood and high density urethane by the sign experts. Search our site on AutoMapit! Sign Design and Fabrication presents SignDesignAndFabrication.com. Our mission statement is very simple... to provide our customers with the most effective signage solutions for their marketing needs. We offer all in-house talent encompassing a variety of graphic fields. Sandblasted signs in high density urethane (HDU) Sign Foam and wood, Led Signs, CNC v-groove routed signs, custom business logo and lobby style displays, sign shields, awards, and plaques, and custom architectural monument signs. If you are in the market for an impressive dimensional sign, you have found the best the sign industry has to offer. We are the ultimate "one stop" signage studio. Check out our Blog Post on Coastal Enterprises site, www.precisionboard.com. The Article is entitled "A Beautiful Sign in a Beautiful Location." Sign Design and Fabrication specializes in marketing and identity, catering to all industries and signage applications. What makes Sign Design and Fabrication unique is that we concept, create and produce all styles of dimensional signage, and all under one roof. Our signs are manufactured using a wide variety of materials such as wood, sign foam, HDU, PVC, glass, stone, tile, marble, brushed and mill finish metals, vinyl, MDO and MDF. Our services utilize the best suited material combinations for each project. This allows us to provide signage solutions that fit your budget and needs. 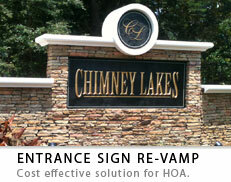 We also house the latest in all sign manufacturing technologies. From sandblasting, CNC routing, (v-groove routed and channel cut), hand carving and expert artisan finishing - we offer only the BEST in every order! Whether you are looking for a custom business sign, residential entrance sign, development directional signs, business park tenant signs, lobby or reception displays, church reader boards or golf course signage, we can provide a solution that will exceed your expectations. and define a sense of taste that will make a lasting impression. All of our dimensional signage products are priced by size, NOT complexity. We offer any sign shape you like, unlimited text and unlimited graphics, so you can have at it! We offer quantity discounts for larger sign orders. We were the first sandblasted sign source to enter the world wide web, and have since set the mark for all dimensional signage production methods and fabrication techniques. Sign Design and Fabrication stocks an endless supply of sign materials, and is always up to date with the latest sign industry technologies. We have individual departments for each business reception style display project production process - fabrication, finishing, shipping, storage and fulfillment. We have your every need, and all under one roof. We thank you for your interest in our sandblasted and other 3D signage products. From the initial design concepts, permitting, fabrication, packaging and scheduled job site delivery, we have you covered... and will make you look fantastic! See our Google Local Business Listing. See our Thumbtack Listing as well!